Exciting news! Selfridges are re-opening their rooftop this spring and it’s undergone a major re-vamp. The Old Forest On The Roof has now converted into a Summer roof deck restaurant and bar, perfect for late evenings and summer days. This is the seventh collaboration between Selfridges and Des McDonald and it’s said to be the best one yet. This Californian-style bar will be relaxing and a place to chill after a long day of (hard) shopping. Feeling peckish? Visitors can tuck into a delicious new menu, from individual grilled dishes to a selection of sharing platters – there’s something for everyone. 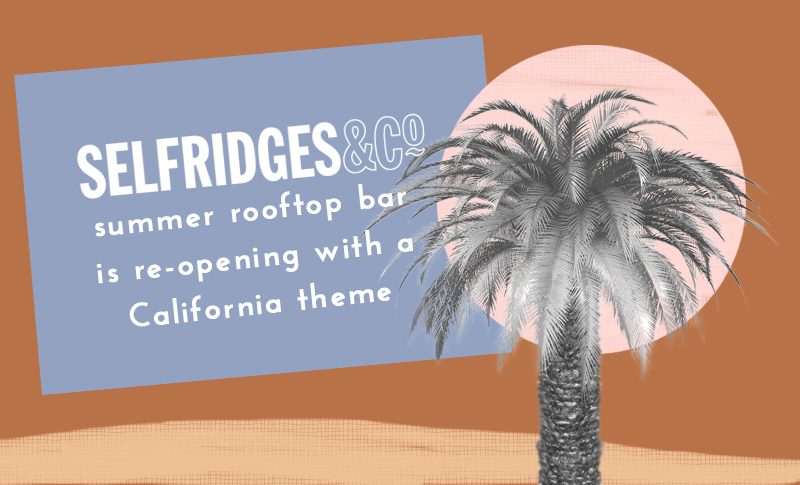 Expect palm trees and wooden beams as inspiration behind the iconic rooftop draws from calm Californian lifestyle, inviting those visiting into a hideaway from London’s busy streets during summer. Guests can enjoy the skyline view of London in the warm evenings, followed by frozen cocktails in private cabanas to continue the evening. Want to visit? To book, call 0207 318 3287 or email info@theroofdeck.co.uk.